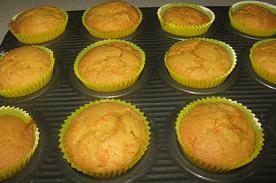 These Carrot Cupcakes are really moist and keep really well. This carrot cupcake recipe is another of those easy,foolproof recipes. The hardest part of this recipe is grating the carrots and we all know that takes hardly any time or effort. I always add the chopped walnuts, but it is optional, and can be left out for anyone with a nut allergy or for small children. 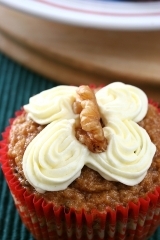 If I have used walnuts in the recipe, I like to pipe the cupcakes with cream cheese frosting and then place a walnut (or crushed walnuts) on top. Preat oven to 350F (180C). Line cupcake pans with cupcake papers. Beat oil, sugar and eggs in small bowl with electric mixer until thick. Transfer mixture to large bowl and stir in carrots and nuts, then fold in sifted dry ingredients. Bake about 20-25 minutes or until a skewer inserted in the center of a carrot cupcake comes out clean. Let cool completely before frosting with cream cheese frosting.